I have no affiliation with this company, just posting a new option for shocks and springs. First shipment of the S30 application arrived. Should be able to order them soon. They have also had Vogtland wind a set of lowering springs. Street setup but probably decent for track days. Low priced and a good alternative to Tokico. I know the owner of Stagg personally and have worked on his 240Z. Jack is a racer and that RX7 is his car. I have not tested these. Tremendous grasp of the obvious. Interesting, any idea of whether they are compatible with DP Racing bolt-in camber plates? I've been on the lookout for shocks to replace the old HPs since they need to be modified to fit DP's spherical bearings. Modifying used Tokicos doesn't make sense to me, especially considering that I don't really like the way they're valved. This is for a street/autoX 260Z on some sort of old-school coilovers and seemingly unsectioned struts. I know this is probably a better question for Stagg but thought I'd throw it out there. Saw them on the interweb a week or two ago (eBay) and wondered about them . Very inexpensive. Thanks for the opinion on quality. I don't see springs for the 280Z's. Maybe later. They show two different shocks for front left and front right, for the 280Z. Probably a typo. http://staggshocks.com/Stagg%20AG/Stagg%20AG%2075-78%20Nissan%20280Z.html But you can't order from the web site anyway, apparently. I can't say anything about the quality but there are review threads on the BMW forums going back to 2010 for the E36 application. $290 for four shocks and springs is really cheap. Even if the shocks are junk you get a set of Vogtland springs. I sent both brandcarparts and Stagg queries on 280Z lowering springs. They don't show as available. Maybe Vogtland has a web site. Edit - they do, but nothing comes up on their search engine, even for 240Z. Maybe too new. I suched and got the following message - "
That's cheaper than what you can get a set of replacement KYB GR2's for via Rockauto. NewZed, since they said that they do have them, are they orderable but just not updated on the website for the 280z kit? Sorry, I meant that they have a web site, not 280Z lowering springs. Shocks for both S30's, springs for early S30's only, apparently. The springs are Vogtland, the shocks are Stagg. I'll repost if I get a reply to my messages. Does anybody have a picture of what a 1.2 inch drop all around looks like? Am I correct in assuming these are so new that no one has installed them yet? I emailed a couple sources about the spring rates, I will post them up once somebody answers. Edit: Disappointing. I have emailed brandcarparts, Stagg, and an ebay vendor selling this kit and not a single reply about the spring rates. Not even an acknowledgment, weird. Just thought I'd update this. So I have emailed brandcarparts and the ebay seller selling these kits, no reply on all accounts. I emailed Stagg directly about the kit, no reply either. I emailed Vogtland about the spring rates and they denied having any springs for Datsuns period. Rather annoying... if Vogtland doesn't officially make datsun springs then wtf are these things? Some sort of knockoff? No, they are most likely Vogtland but not a specific Datsun application. Probably some other application that has a good rate and the correct dimensions. Like the Moog Chevette springs a lot of people run as an OEM size upgrade for the stock Datsun springs. The small market may lower the value of time spent returning e-mails and responding to queries. I didn't get any replies either. Maybe one of those "here if you want it but we don't have time to support it" deals. Where are the 280z springs listed for sale? I didn't see them on the website. Edit: looks like the shock and spring package are now on the site. Thanks for the link John. Ended up ordered a set of shocks and springs for my 280z Chump Car. Just started on the back and noticed the rear shocks are 3" shorter then the originals and did not come with any spacers. Can't find a phone # for brandcarparts.com but I sent them an email to see if they forgot to send the spacers. Going to start on the front and see if I have any other issues. I ordered a set of Stagg shocks for my 240z which had 4 blown ones. So far I have installed 3 of the 4 shocks with no issues and should fit my needs as an alternative daily driver for work and weekend cruises as I continue to build my LS1 280. Time will tell if it was worth going with these or should have gone with another budget minded brand. I am thinking at least a few years and the pricing was cheap with shipping. Fitment and sizing are fine and is a good option for a budget stock setup if anyone was considering them. Alright, another update. Stagg shows #552205 listed for the front and #552204 for the rear. Also their website lists the same part numbers for the 240Z-280Z. I mentioned that the rear was too short but after I removed the front shocks I noticed the front Stagg ones were too long. Based on the part numbers on the boxed and on the shocks this is how they should go. 2 top shocks are front and 2 bottoms are rear. Now if I switch them around the Stagg 552204 fit the front perfect. It came with a large and a small gland nut in the box and the larger one fit. The 552205 is still 2” short for the rear and only came with a small gland nut that doesn’t fit the front or the back. Pic of the shocks swapped around. I ended up making a 2” spacer and reusing the old gland nuts to install all the shocks. Not thrilled I had to make them fit but it makes me question if they are even the right shock or valving for my car. 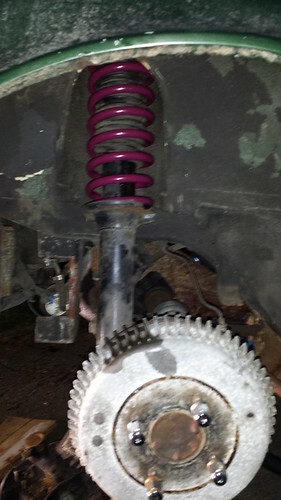 I haven’t gotten the car back on the ground but here are some pic of the springs installed. Actually Stagg shows two different part numbers for the front of a 280Z. 552205 and 552206. Posting the three links that you probably looked at. The Brand page even shows the two gland nuts, so at least the pictures represent what they ship. Maybe someone at Stagg and/or Brand will see it and do some housekeeping. Edit - Stagg shows the same part numbers, with the same error, for the 240Z. They probably got their fronts and rears switched and put both 240Z and 280Z numbers on the page. Maybe 280Z rear is actually 552206, and 552205 (which you got) is the 240Z rear. Brand doesn't list part numbers, only application, so the order process is kind of screwed up. Did your old gland nuts fit tightly on the top of the shock? Yes I saw that they had the 552206 listed but as the front right shock only? I emailed Brand and Stagg along with leaving a voicemail for Stagg. So far no word back but its been less then 24 hours. I'm hoping they just mixed up all the numbers. The old gland nuts fit the new shocks fine and everything is tight with the spacer. Sorry for the late update. I was able to get a hold of John and he was able to sort everything out. The part numbers on the Stagg and brandcarparts sites were indeed mixed up but he was able to have it fixed the following day. Over all the ride is firm but not bouncy and the springs and shocks feel like they are well matched. This setup made a big difference at last weekend’s autocross and over all its working out nicely. For reference here are the correct applications. #552204 fronts for 240-280z and come with both gland nuts. Springs also available separately now on the site too. The car is not very presentable since it’s a Lemons/Chump build but here is a quick picture. Any idea if the springs do much lowering? Your picture looks kind of stockish in height. I'm pretty sure the setup is for stock length strut tubes so you won't see more then an inch or maybe an inch and a half of lowering. Just looking for the real world number. The ad copy says 1.25", on brandcarparts. Great to have another option.